immi: Do you qualify to stay in U.S.? On March 22, 2017, the Secretary of Homeland Security, Secretary Kelly, announced a 6-month extension of Haitian Temporary Protected Status (TPS), until January 22, 2018. That means that more than 50,000 Haitians can apply for permission to continue working and living in the United States until January 22, 2018. This decision is a victory for Haitians and all Americans – even though it is not enough. Generally TPS is granted for 18-months at a time. The fight to extend TPS beyond January 22, 2018 will continue. If you have any questions about the process of applying for an extension of TPS and work permission, it is important that you consult with a reputable legal services provider as soon as possible. Make sure you find a trustworthy legal services provider. Visit our legal section for a list of legal services providers by zip code. How do I extend my TPS and work permission? If you have TPS and a work authorization card that expires on July 22, 2017, you can apply to extend your TPS and work permission for 6 more months. In order to receive permission to work for the 6-month period, you must file 2 separate forms. One form, I-82, is to extend your TPS. The other form, I-765, is to extend your work authorization. You must file both forms if you want to extend your work permission. How much does it cost to extend TPS and permission to work? There is no fee to extend TPS. The filing fee for fingerprinting is $85. The filing fee for work authorization is $410. Can I have my fees waived? Some people are eligible to receive a waiver of the fee requirement. For more information about eligibility for a fee waiver, go to the USCIS website. Does it take longer to receive a receipt when applying for a fee waiver? Yes, it may take longer to receive a receipt for your TPS and permission to work applications if you file a fee waiver. When can I file an application to extend my TPS and work permission? You must file the applications for TPS and work authorization between May 24, 2017 and July 22, 2017. It is important to file these applications as soon as possible in order to continue working after July 22, 2017. Why do I need to file my TPS and work permission applications as soon as possible? If you want to continue working after July 22, 2017, you must show your employer a receipt notice for your work authorization application by July 23, 2017. It can take a few weeks to receive the receipt notice after you file your applications. It’s important to file your TPS and work permission applications as soon as possible so that you receive your receipt notice back from USCIS before July 22, 2017. Is there an automatic extension of permission to work? The automatic extension process is different for this TPS extension than it was for previous Haitian TPS extensions. 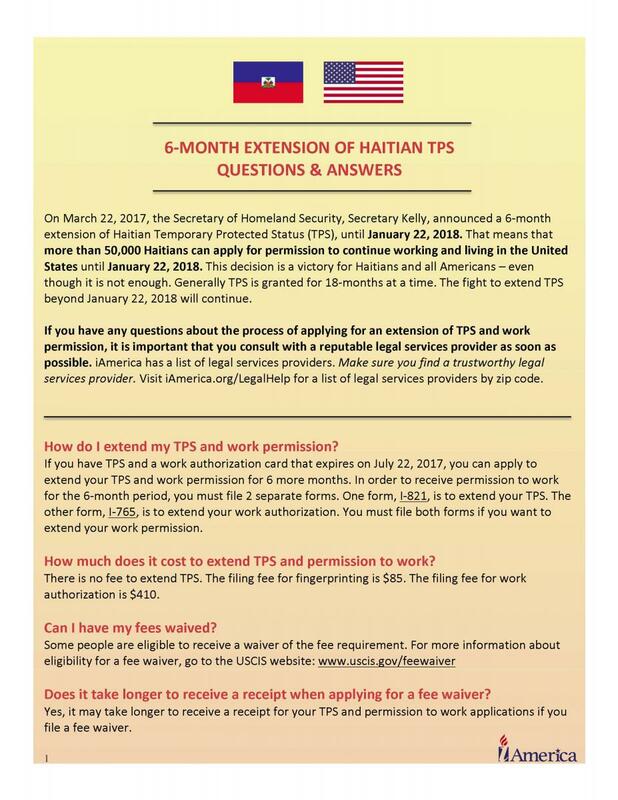 In the last Haitian TPS extension, all Haitians who had received work authorization were automatically entitled to work permission for 6 months. Now, the automatic extension of permission to work only applies once you have a receipt for your work authorization application. Then your permission to work is automatically extended for 180 days. When you have received the receipt for your work authorization application, you can show your employer the receipt and your current work permission card. These two documents will prove that you are automatically authorized to work for 180 days. Where can I find the information about the extension of TPS and work permission? The Department of Homeland Security published a Notice in the Federal Register on May 24, 2017 that lists information about the extension of Haitian TPS, including information on the documents you can show your employer to prove that you have permission to work under TPS. A copy of the Federal Register Notice on the extension of Haitian TPS can be found here. What documents do I need to file with my TPS extension application? You need to include proof of your identity and nationality, your date of entry to the United States, your residence in the United States since January 12, 2011, and your physical presence in the United States since June 23, 2011. What documents can I use to show identity and nationality? What documents can I use to show entry date and physical presence in the U.S.? What documents can I use to show my residence in the U.S.? Can I apply just for an extension of TPS and not work permission? Yes. You can apply just for an extension of TPS by filing form I-821, the fingerprint filing fee of $85, and documents to support your application. It is important to extend your TPS status so that you continue to have permission to be in the United States. Can I apply for other types of immigration status after I apply for my TPS extension? Yes. 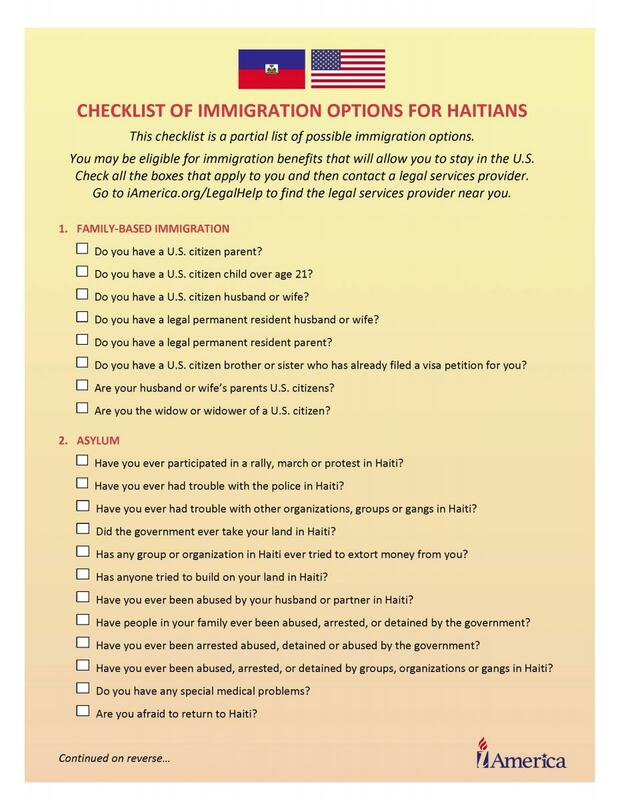 Many Haitians are eligible for other types of immigration status and benefits. If you are interested in looking into whether you qualify for other types of immigration status during the TPS extension period, it’s important to seek the assistance of a reputable legal services provider. iAmerica has a list of legal services providers. Visit our legal section for a list of legal services providers by zip code. How do I know if I qualify for other types of immigration status? To get a general idea of some of the requirements for other types of immigration benefits, use this checklist of eligibility requirements for various types of immigration status. This is not a complete list and it’s important to check with a reputable legal services provider to learn whether you qualify for another type of immigration status. Is there a deadline to apply for other types of immigration status? It is important to apply for another type of immigration status as soon as possible. If you extend your TPS, you will be “in status” until January 22, 2018. In many cases, being “in status” will help you when you apply for another type of immigration status. Don’t forget, filing an application for an extension of TPS and your work authorization now may allow you to take advantage of other immigration benefits in the future and preserve your ability to file for future TPS extensions. This checklist is a partial list of possible immigration options. You may be eligible for immigration benefits that will allow you to stay in the U.S. Download this checklist, check all the boxes that apply to you and then contact a legal services provider. Sign up and be among the first to be notified on tools to help immigrant families become part of America's democracy. Get the latest news, alerts, and critical actions from iAmerica Action. You are leaving www.iamerica.org. By clicking 'OK' below, you will be directed to iamericaaction.org, a website operated by an independent iAmerica Action 501(c)(4) entity.